Marian Hall Home is a personal care facility situated at Mount Assisi, an 11-acre campus, high atop a hillside overlooking beautiful vistas in the northern suburbs of Pittsburgh. It is state-licensed, and has been dedicated to professional, respectful caring for the elderly since 1970. Marian Hall is located at Mount Assisi, the home of the School Sisters of St. Francis. We provide 60 private, furnished rooms in two buildings that include modern security systems. Each room includes a private bath, individual temperature control, and an emergency call system. Laundry, linen, and housekeeping services are also part of our daily care. Telephones and cable television are available at affordable fees. 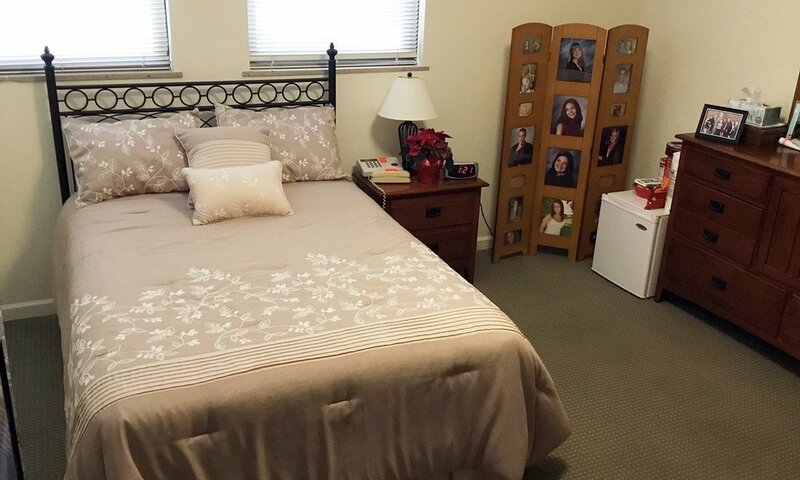 Residents can provide their own personal furniture, if they desire. Our dining room is open for three meals and two snacks each day. Food is also stocked in resident lounges on each floor. Residents find that Marian Hall has a family atmosphere where they can be as independent as possible. They enjoy unlimited visitation privileges, both on and off the Mount Assisi campus. All in all, Marian Hall is a great place to live! Founded in Austria in 1843, the School Sisters of St. Francis came to the United States from Bohemia in 1911 to teach, first among the Slovak peoples of western Pennsylvania. The order flourished here, and soon required a convent. Mount Assisi Convent was consecrated in 1928 as the order's motherhouse in the United States. Mount Assisi Academy, a high school for girls, operated on the grounds from 1938 to 1978. A well-recognized facility in the local area, the beautiful grounds at Mount Assisi now provide a home for both the Marian Hall Home personal care facility and Mount Assisi Academy Preschool. The convent also remains home to the sisters. The exterior beauty of Mount Assisi adds to the enjoyment of Marian Hall residents, who also find their life enhanced by their newly renovated rooms and lounge areas, and the facility's beautiful chapel. Marian Hall Home is conveniently located near Interstate 279 in Bellevue, Pa. Our GPS address is 1515 Quaill Avenue, Pittsburgh PA 15202. Click here to get specific directions from your location. From the South, take Interstate 279 North to Exit 5 and turn right. Go to the stoplight and turn left onto Perrysville Avenue. Travel about one mile to Bellevue Road (second light) and turn left. Follow Bellevue Road about one and one-half miles to Quail Avenue. Bear right and you will be at the front entrance to Mount Assisi. The parking lot for Marian Hall Home is on your right as you enter. From the North, take Interstate 279 South to Exit 5, bear left, and follow the directions above.